Dark chocolate with 74% cocoa solids. 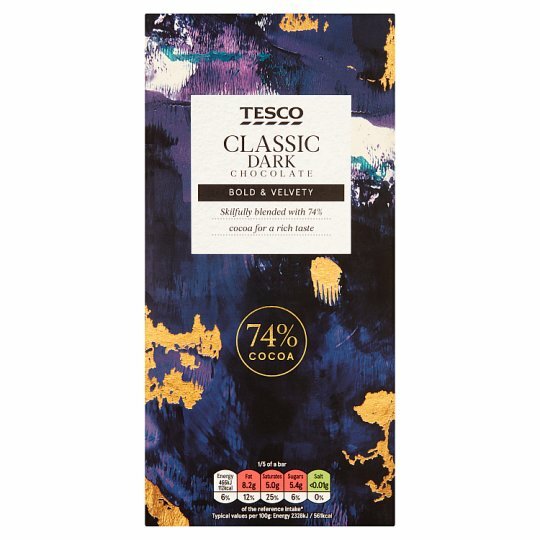 BOLD & VELVETY Skilfully blended with 74% cocoa for a rich taste Our chocolatiers, based in the north of France, source rich cocoa directly from Rainforest Alliance certified farms in the Ivory Coast. Drawing on over 40 years of experience, they perfectly blend this cocoa with high quality ingredients to create rich, decadent chocolate bars. INGREDIENTS: Cocoa Mass, Sugar, Cocoa Butter, Fat Reduced Cocoa Powder, Emulsifier (Sunflower Lecithins), Flavouring. We purchase a volume of cocoa from Rainforest Alliance Certified™ farms equivalent to the volume used in this product, For more see: www.tescoplc.com/certifications. May contain peanuts, nuts and milk.